Bundle and save with these package sets. 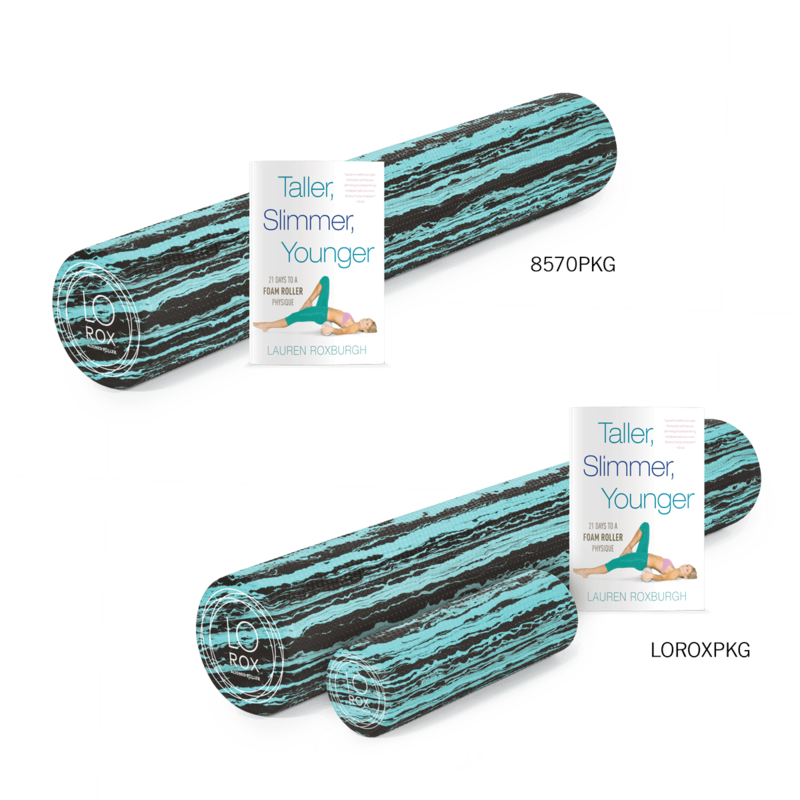 Option 1: Full-size LoRox Aligned Roller™ foam roller and Taller, Slimmer, Younger book. Option 2: Full-size roller plus travel-size roller and exercise book. Developed by fascia and alignment expert Lauren Roxburgh, the full-size Aligned Roller is designed to elongate muscles, tone the body and provide regenerative massage. It features a moderate density made from durable EVA foam; perfect for improving blood circulation throughout fascia, skin, muscles and joints. Roller measures 36” L x 6” diameter. Fascia and body alignment expert Lauren Roxburgh presents a system based on the Rolfing “10 Series” combined with elements of Pilates. Having worked with numerous celebrities and professional athletes, Lauren understands the need for an effective program that fits into busy schedules. In just 15 minutes a day, her 21-day program guides the reader through a series of foam rolling techniques for a balanced, aligned and more youthful body, as well as a calmer state of being. Using only a foam roller, the reader will elongate muscles while also releasing tension, hydrating fascia, calming the nervous system, breaking up scar tissue and flushing out toxins. 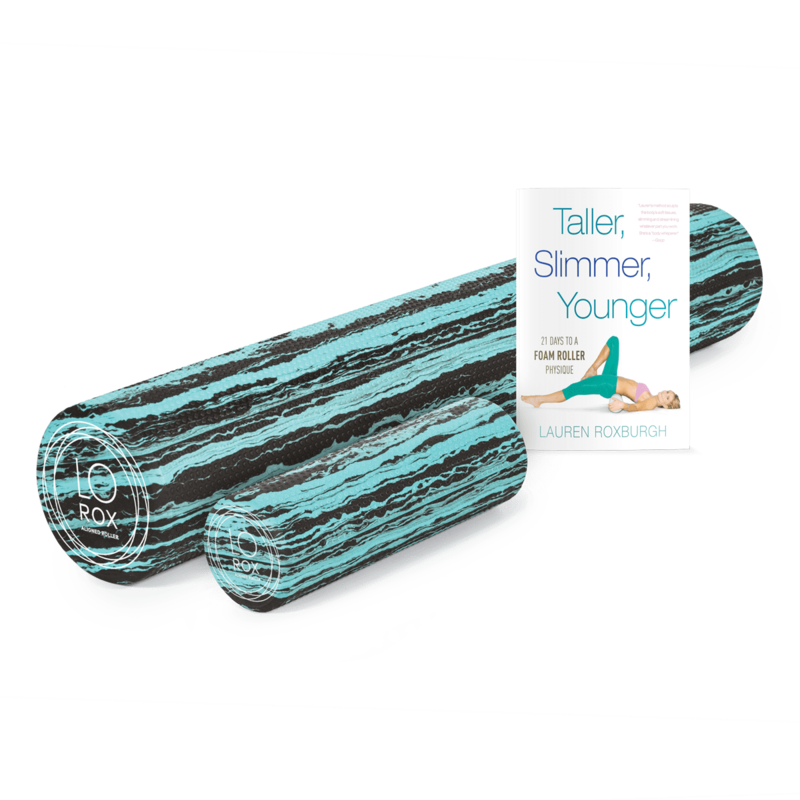 This package contains the full-size Aligned Roller as well as the Taller, Slimmer, Younger book described above. It also includes the LoRox Aligned Travel-Size Roller™; a portable 12” L x 4” diameter foam roller. The Travel-Size Roller is constructed of the same material and provides the same benefits of use as the full-size roller. Its small size makes it perfect to toss in a gym bag and easy to use on the go. * Please select your package option from the dropdown menu. Foam rolling in the past was a last resort when I was in so much pain in my hips and back that I couldn&apos;t take it anymore. 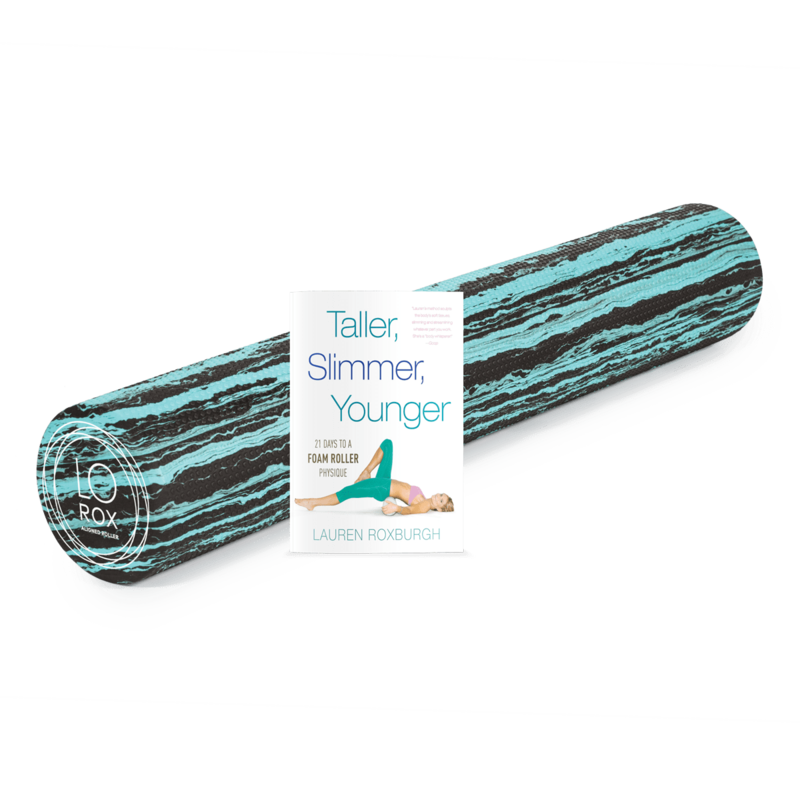 Lauren&apos;s book and her amazing roller, teach you to LOVE foam rolling and to learn that when it becomes a daily habit, it&apos;s not a torture device but instead an amazing tool to align your body correctly so it doesn&apos;t have to hurt anymore. I&apos;ve created more space in my back and ribs and my hips feel more even and aligned! The roller is the PERFECT density, not too hard but hard enough to get out the kinks! Have been recommending this to ALL my friends and family (my dad is secretly obsessed too with Lauren&apos;s method and uses the roller I bought for him daily, too!). I bought the book and roller combination after a friend recommended it and it has been fantastic. I&apos;ve struggled with weight issues for some time, but as Lauren says in the book, when you get your system working properly and efficiently, it is easier to get the weight off and keep it off. I have eased back on the cardio I used to do and now roll every day. The roller is also great - not too hard and so it is not painful like some rollers can be. I recommend getting both and doing the full program. This book helped me to address some long standing issues, especially a persistent bad back. I had tried rolling before but always found it to be painful but the LoRox roller is the perfect density and the exercises in the book showed me many new ways to use the roller. I have incorporated this into my regular exercise now and come back and repeat the sequences in the book every week. Great combo! Thanks.